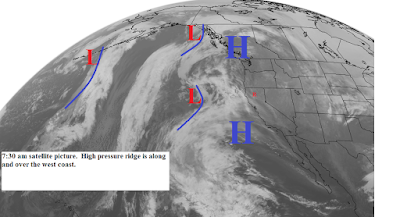 This morning's satellite picture (below) shows the high pressure ridge still along and over the west coast with lots of high clouds streaming northward over the west side of it. The map below shows not a lot of change over the next 7 days. Northern California will be partly sunny with some high cloudiness. Day time temperatures will continue above normal. The European model weakens the high pressure ridge next weekend and lets a low pressure area move through our area. But the other models hold the ridge in place.